Windows 10 comes with a new options which allow you to enable Auto Correction and Text Suggestions for a hardware keyboard connected to your device. Auto spelling correction is really great feature of the OS when you are not sure about the spelling of a word. Windows 10 includes a touch keyboard for computers and tablets with a touch screen which supports Auto Correction and Auto Suggestions. When you touch any text field on your tablet, the touch keyboard appears on the screen. 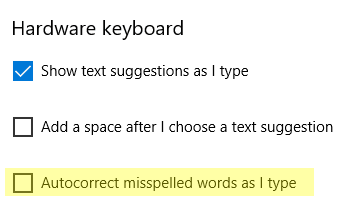 The recent versions of Windows 10 come with an ability to enable Text Suggestions for the hardware keyboard.